Harley Single-Fire Ignition: Dynatek’s Dyna 2000 Contributor: Anonymous Harley-Davidson’s do not come stock with a single-fire ignition but instead have a dual-fire ignition. A dual-fire ignition uses a single coil that fires both spark plugs simultaneously. While efficient enough to pass EPA standards this setup ultimately results in a wasted spark. The alternative is a single-fire ignition. A single-fire system will only fire each spark plug on that cyclinder’s compression stroke. The result is a dedicated and increased spark delivery. Another advantage of these upgraded ignitions is the ability to select the rev limit and choices of advance curves. Please note that changing the ignition on a newer Twin Cam or V-Rod requires a Password Learn procedure to be performed to the ECM. Click here for instructions. For this review a 96 Fat Boy was used to demonstrate the installation of a Dyna 2000 HD1 Programmable Ignition. With the seat removed Dynatek’s instructions easily led through the installation process. As with any electrical work be sure to disconnect the battery terminals first. 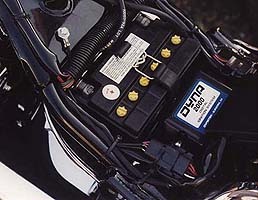 Dynatek’s module plugs right into the stock harness and because Dynatek’s unit is the same size and shape as the original it uses the stock screws for mounting. 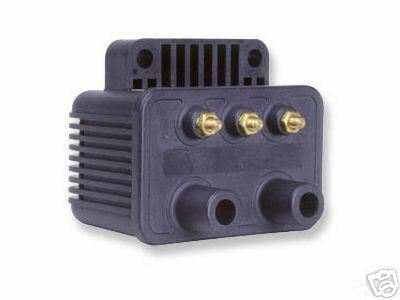 Unlike Harley’s original module, the Dyna 2000 has a row of DIP switches for programming four new rev limits of 6000, 6500, 7000, or 7500 rpm, and four separate advance curves to enhance performance. There is also your choice of single or dual-fire. An LED diagnostic light permits static timing for those familiar with this procedure. Dynatek has charted the curves in the instructions and recommends some appropriate settings. We selected a mildly aggressive curve and a rev limit of 6500. Be sure to check the specs and/or consult someone regarding your choice. When selecting a coil be sure to check for compatibility with the Dyna 2000. Removing the original coil is simple, but installing new duals may take some patience when routing the wiring. Once installed it was time for a test ride. The engine started immediately and settled to an even idle. Much of the original vibration is gone. Starting off the throttle response is smooth and slightly higher. Lower gears feel very much the same but acceleration in top gear feels very steady and strong. Acceleration uphill has a positive response without fading. On the straight-away, rolling on in top gear never hesitated for a moment and really answered the call. Combined with a properly tuned carb and a free-breathing exhaust and aircleaner, the Dyna 2000 ignition is the performance topper for any EVO powerplant! Dynatek’s other ignition products are available for Twin Cam and other Harley applications. Dynatek and other single-fire ignitions can be found online or at your local dealer. Enjoy the Ride! Return to Harley Performance Tech Tips from “Single Fire Ignition” for more tech tips and articles. Additional tips and advice are shared daily on our Bike Talk Motorcycle Forums .